"I hadn't realized that my hand was quite so deep into the liquid. Amazingly, I barely felt the cold at all. My skin didn't get hurt for the same reason that water droplets dance on a hot skillet. An insulating layer of steam forms almost instantly between the water and the metal, keeping the droplets relatively cool as they float for several seconds without actually touching the hot surface. 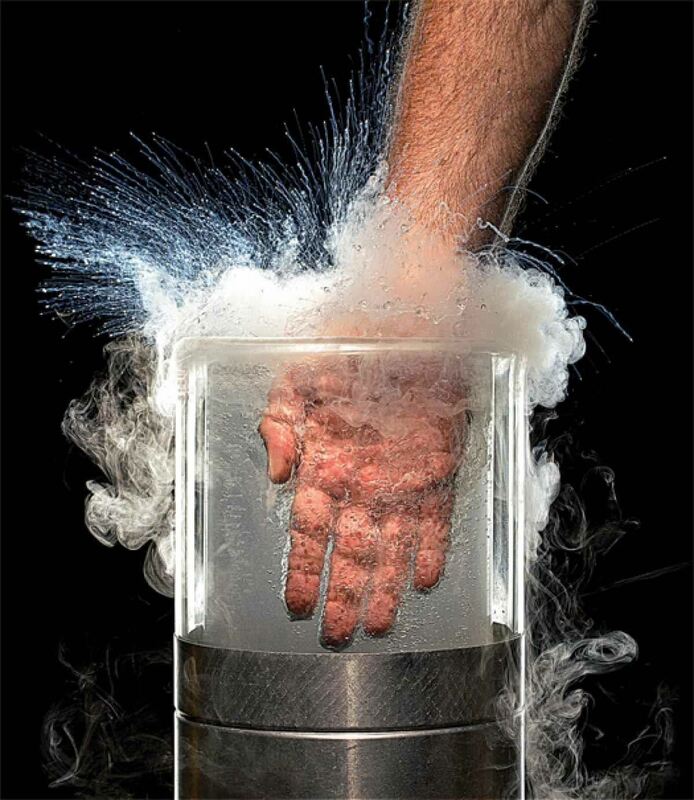 To liquid nitrogen, flesh is like that skillet—a surface hundreds of degrees above its boiling point. So the moment my hand touched the liquid, it created a protective layer of evaporated nitrogen gas, just as the skillet created a layer of steam. That gave me just enough time to put my hand in and pull it out again. Any longer than that, and frostbite would have set in. The phenomenon is called the Leidenfrost effect (after Johann Gottlob Leidenfrost, the doctor who first studied it in 1756). I'd known about it for years, but when it came time to test it in real life, I have to admit that I used my left hand, the one I'd miss less." Nurd Rage also has a how-to article here on WonderHowTo on the same topic. You can watch his video below. That's his right hand.. Watch the tumb. What part and why does it matter? I think it's believable. The science is there. I was talking about the left hand issue. The video is of a different person altogether. Notice above the video it says: Nurdrage has a "HowTo" on the same topic, though he also warns: Do not try this at home.